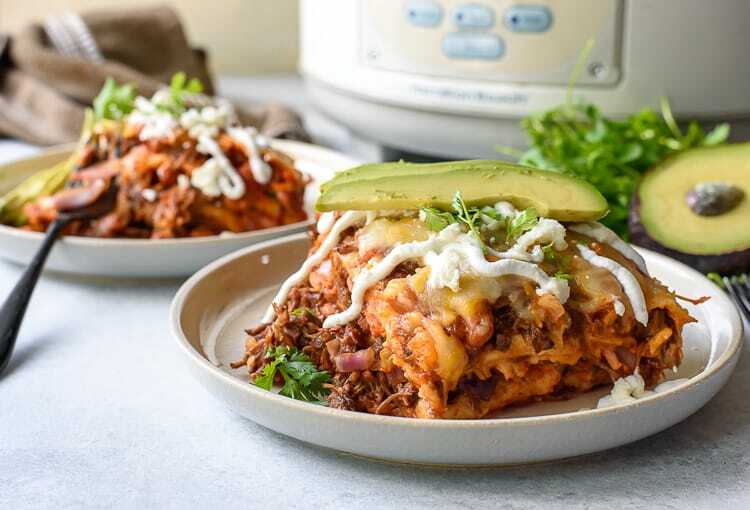 Take your lasagna south of the border with this easy Slow Cooker Mexican Lasagna with Barbacoa! Spicy and saucy shredded beef and soft tortillas replace the classic ingredients in this fun, twisted weeknight meal. I teamed up with the Partnership for Food Safety Education on this post to not only bring you a delicious recipe, but to help increase awareness about food safety during Family Meals Month! So who else is trading in their grill for their slow cooker this week? I love LOVE slow cooker meals all year round. Nothing beats a dump and go recipe that is nearly impossible to overcook, but for some reason, they make the most sense when summer is over. For those of you with kids, easy meals are obvious. Running around for school and extracurriculars during the week, quality time on the weekends…slaving over dinner isn’t an option. For us two-unit families, it’s a little easier, but that obviously depends on how busy life is! That work hustle combined with socializing, health routines, Sunday football…you get the idea. 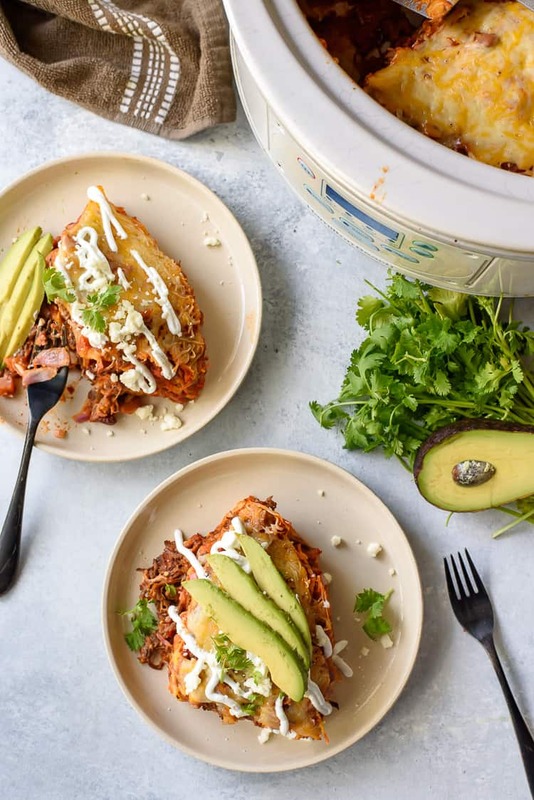 Your slow cooker is the closest thing to your Mama’s meals, and it’s time to become besties with it again for comfort food season! And I really think you should start with this Mexican Lasagna. 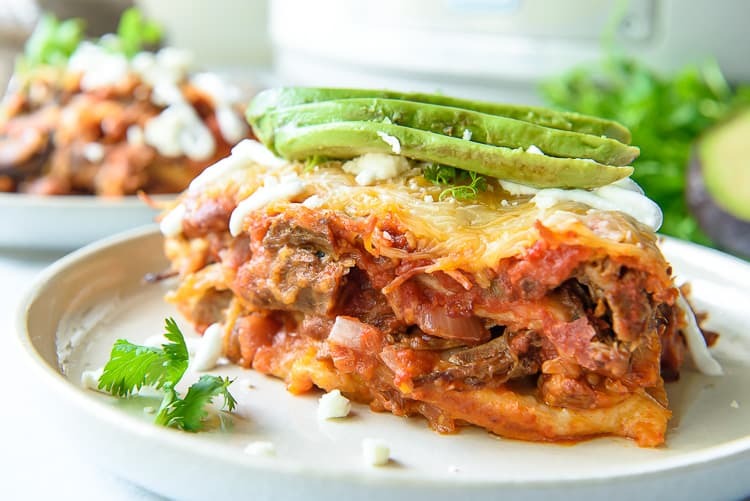 JUST TAKE ME TO THE MEXICAN LASAGNA RECIPE ALREADY! 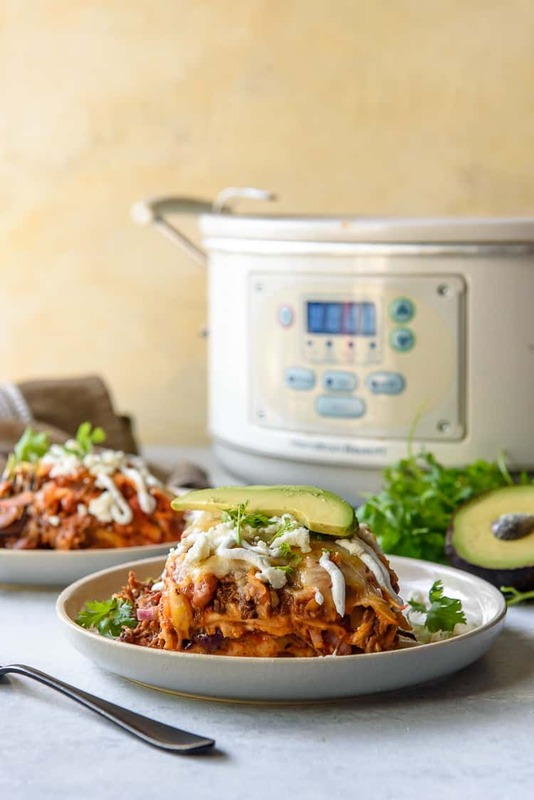 If you’d rather skip my (pretty darn helpful) tips and tricks, essential cooking info, and similar recipe ideas – and get straight to this deliciously easy slow cooker recipe, just scroll right on down to the bottom of the page where you can find the printable recipe card! So, what do you know about food safety? Having worked in food retail for the last 18 years or so, I’ve learned quite a bit about foodborne illnesses and how to prevent them. I’ve also found that many of my friends and family have zero clue about how dangerously they treat their food. I’m not going to bore you with scary names or symptoms. Instead, I’m gonna keep it real and real simple by saying you really don’t ever want to deal with one of them. I’ve seen it. I’ve been there. It’s not pretty. The good news is that prevention of foodborne illness is as easy as always following The Core Four. As in wash your hands for 20 seconds, rinse your fruits and vegetables, and wash your utensils and cutting boards before and after you cook. This prevents bacteria from spreading from both food and non-food surfaces. Cross-contamination is the enemy. When shopping, keep raw meats, seafood, and eggs separate from your other food. Store raw meats properly in your fridge, and never above ready-to-eat food. Always use separate cutting boards for meat, poultry, and seafood, and never place cooked food on a plate that once held the raw version. All food is considered safely cooked when it reaches a high enough internal temperature to kill the bacteria that causes foodborne illnesses. Use a meat thermometer to measure proper temps at the thickest part of the meat. The safe temp for steaks, roasts, and fish is 145 degrees F, ground meat is 160 degrees, and poultry (as well as leftovers) is 165 degrees. This is where most foodborne illnesses come to be. When you get home from grocery shopping, refrigerate (at 40 degrees F) or freeze (0 degrees F) all perishables immediately. Before dinner, be sure to pull out ingredients no more than two hours before cooking. Never defrost food at room temperature. Thaw either in the refrigerator, cold water, or the microwave. After dinner, leftovers must be packaged and stored in the fridge within 2 hours to avoid bacteria growth. To learn more about food safety, foodborne illness, and how simple it is to reduce your risk of catching them, visit The Story of Your Dinner. Spray the slow cooker crock with cooking spray. Spread 1 cup of salsa on the bottom of the cooker. Layer tortillas on top of the salsa. Place a layer of shredded barbacoa beef on top of the tortillas. Top with ⅓ each of the beans, onions, remaining salsa, and cheese. Add another layer of tortillas on top of the cheese. Repeat the process two more times, beginning with beef and ending with cheese. Cover and slow cook on low for 3-4 hours. Remove the lid in the last 15 minutes to release some of the moisture. Serve with sour cream, avocado, queso fresco, and cilantro. Any kind of Mexican sides would be a great addition to this dinner. Try some Spanish rice, guacamole & tortilla chips, corn salad, or jalapeno cornbread. 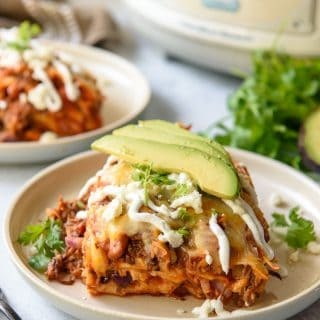 Can Mexican Lasagna be Frozen? Yes – after assembly but before cooking. However, I wouldn’t recommend tying up your crock with it! Build the lasagna in a well-greased crock and freeze it overnight. The next day, carefully remove it from the crock and wrap it in a double layer of plastic wrap, then a layer of aluminum foil. Freeze it for up to 3 months – when you’re ready to cook it, simply plop it back into the crock like a peg in a hole! The only difference will be the cooking time, which I would recommend increasing by at least 2 hours to ensure no cold spots. Wash hands with soap and water. Place guajillo peppers into a bowl and fill with warm water until covered. Soak 30-60 minutes until softened. Season chuck roast with salt and pepper. Heat a large cast iron pot over high heat. Add oil, then sear chuck roast on all sides. Once seared, remove pot from heat and set aside. Wash hands with soap and water. In a blender, add soaked guajillo peppers, chipotle, garlic, broth, lime juice, cider vinegar, cumin, oregano, cloves, ½ teaspoon salt, and ¼ teaspoon black pepper. Blend until smooth, adding more broth if necessary to thin it out. Taste and adjust seasoning by adding more salt, pepper, or lime. Pour sauce over chuck roast. Cover with the lid and cook for 3 hours, until meat is tender and the internal temperature reaches 145 degrees F on meat thermometer. Use two forks to shred barbacoa. Gently rub cilantro under cold running water. Pat dry with paper towels. Lightly spray the inner bowl of the slow cooker with cooking spray. Spread 1 cup of salsa on the bottom of the cooker. Place a single layer of tortillas on top of the salsa, cutting them if necessary to fit the crock pot and cover the salsa completely. Place a layer of shredded barbacoa beef on top of the tortillas. Top with ⅓ each of the beans, onions, remaining salsa, and cheese. Add another layer of tortillas on top of the cheese. Repeat the layers two more times, beginning with beef and ending with cheese. Cover and slow cook on low for 3-4 hours. Served with a drizzle of sour cream, chopped avocado, queso fresco, and cilantro, if desired. PIN THIS CROCK POT LASAGNA RECIPE FOR LATER! 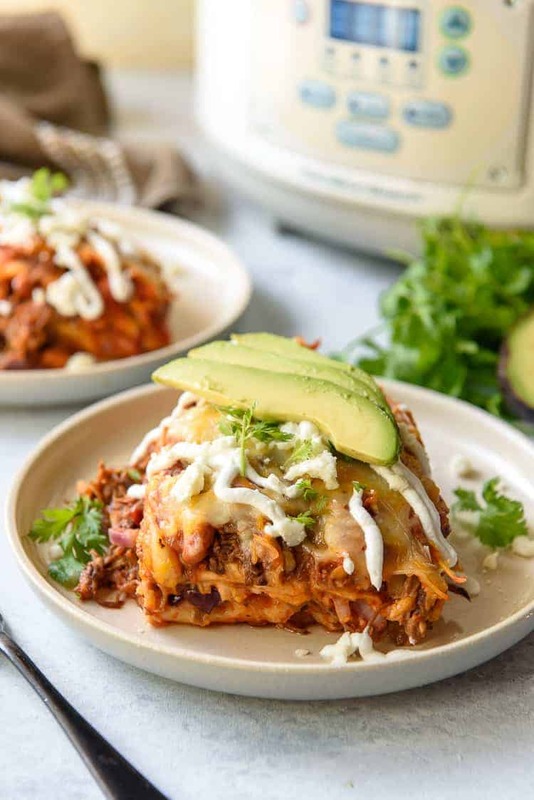 SOOOOO super excited to try this slow cooker mex lasagna! It looks DIVINE! Wow! A cross between Mexican and Italian all in one dinner! Love it! This is just the type of meal I like to get on early in the day and know that it will be ready when everyone else is. Since I love Mexican, this one is a no-brainer to add to my list of meals to make. Thanks for reiterating those food safety tips too. It’s always good to be reminded. this is so clever to use the tortillas to make lasagne. 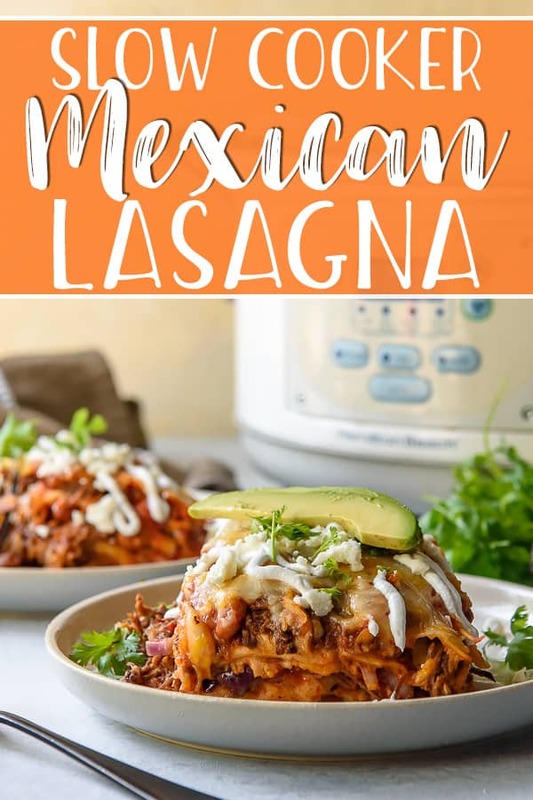 I’ve never made lasagne in the slow cooker but now I can’t wait to try it! This is perfection! Would love to try it!